Mobile Virtual Network Operator (MVNO) Market size was over USD 55 billion in 2017 growing at a CAGR of over 12% from 2018 to 2024. The continuously growing demand for low-cost data and voice services is driving the MVNO market growth. This is encouraging the service providers, who purchase the network services from the Mobile Network Operators (MNOs) at wholesale rates and sell these as bundled services at lower rates than those of MNOs. These services enable the cable operators to offer targeted products & brands and reduce the customer churn rate, thus compelling the MNOs to switch to these services. Growing number of mobile subscribers and increasing penetration of smartphones are expected to positively impact the MVNO market growth. In 2017, the global unique subscriber base reached 5 billion. According to the latest Ericsson Mobility Report, the growth in the mobile traffic across the world was registered to be 70% between the end of the first quarter of 2016 and the first quarter of 2017. The majority of the growth in the mobile traffic is attributed to the rapidly increasing use of smartphones. This will attract newer vendors in the industry, creating lucrative opportunities for growth. Declining profit margins are expected to restrain the MVNO market growth over the forecast timespan. The companies are unable to lower their costs at the same speed as they are lowering the prices. Furthermore, the demand for voice and SMS that are high revenue-generating segments is declining rapidly, further affecting the industry growth. 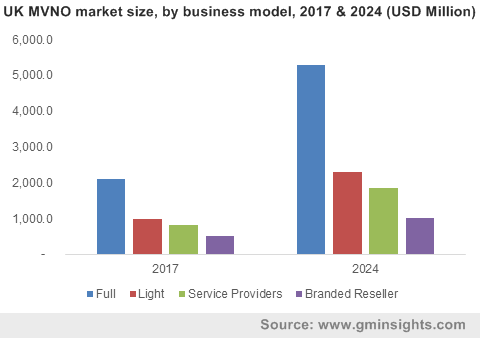 The light MVNO market is expected to grow to reach over USD 30 billion by 2024, due to the high profitability and increasing customer focus in this business model. 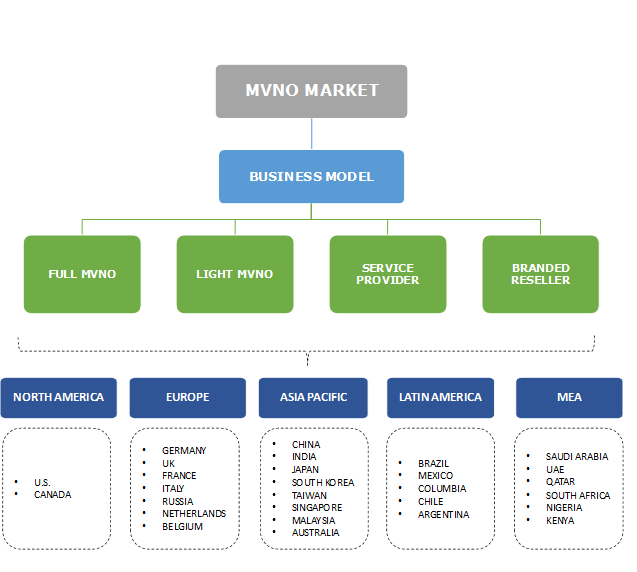 In this model, the MNOs give the complete ownership of the clients to the vendors. This allows companies to invest in the analysis of customer preferences and enables the companies to provide customer-specific packages. This model is expected to attract a large number of customers as the customers can access cost-effective and high-quality services. The full MVNO market valued at over USD 25 billion is expected to grow as small companies are becoming increasingly inclined toward expanding the businesses. The business model allows the companies the generation of new revenue streams from untapped segments such as rural areas. The companies with this business model are creating newer ideas for cost-effective and customer-centric services such as unique voice & data plans to attract customers. Increasing customer loyalty is encouraging the increasing number of players to adopt the business model, creating growth opportunities for the industry. The Germany MVNO market has witnessed a significant growth with revenue of around USD 11.0 billion and over 48 million subscribers in 2017. As a part of the consolidation wave in Europe in 2014, the industry witnessed the consolidation of E-Plus and O2, resulting in the price competition. To regulate the competition, the regulators imposed the access of about 30% joint network capabilities to the MVNOs in the country, thus increasing the penetration of these services. Furthermore, the consolidation of 1&1 Telecommunications SE and Drillisch will provide viable growth opportunities to the providers. The China MVNO market is expected to grow at CAGR of 16% from 2018 to 2024 with over 59 million subscribers due to the imposition of favorable regulations. In 2014, the Ministry of Industry and Information of China issued 37 MVNO licenses to increase the competition in the mobile sector. In 2018, the government announced the issue of formal licenses to private firms that resell mobile services as virtual networks. The industry in China is characterized by low ARPU and high focus on low-end prepaid users. Some of the key vendors in the MVNO market include LycaMobile, Giffgaff, Freenet AG, Exetel, Drillisch Telekom, Dataxoom, TalkTalk, Tracfon, Kajit, Japan Communications, Inc., and Consumer Cellular. The industry is characterized by the increasing number of collaborations of mobile network operators with the vendors to increase the price competition by offering low-cost services. Price and service differentiation are the key strategies adopted by the companies in the MVNO market. The companies are continually introducing new plans and business models to survive the competition in the fragmented industry. For instance, in February 2017, Masmovil, a Spain-based virtual network company announced the acquisition of Llamaya. With this acquisition, Masmovil gained a customer base of around 170,000, thus expanding its business. In the same year, Denmark-based TDC Group announced the acquisition of Plenti, a B2C virtual network company. With the acquisition, TDC will seek the transfer of Hi3G Denmark customers to its own network infrastructure. In the early 1990s, the telecom industry underwent new regulations, liberalization, increase in the number of wireless subscribers, and the evolution of 2G networks. Increasing competition and the introduction of new technologies, such as handheld devices, enabled better service and cheaper cellular phones, propelling the MVNO market growth. In 1997, Sense Communications established a capacity-sharing agreement with Sonera in Finland and subsequently in 1999, the company signed a service provider agreement with Telenor for capacity access in Norway and Sweden. With this development, the regulators in Denmark forecast a promising MVNO market in the country as a cost-effective option for the telecom companies to enter the industry. Regulations were passed in several countries thereafter allowing the agreements of network access between virtual network providers and the MNOs. By 2008, the wireless subscribers in the U.S. had a choice between 40 vendors. With this, the cost-effective capacity-sharing model evolved, aiding the growth of the MVNO market.